The 1600 Turbo Series III WAM is powered by a liquid-cooled, turbocharged, four-cylinder, 60-hp (44.7-kW) at 3000 rpm, PS diesel engine. 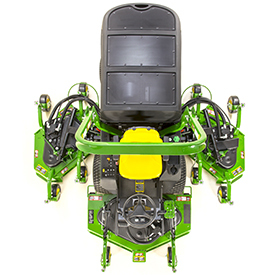 The composite center section includes air-intake screens and helps to guide the cooler air from above the machine to the radiator. The design provides a uniform distribution of clean air, as well as minimizing the amount of chaff collection on the exterior screens. 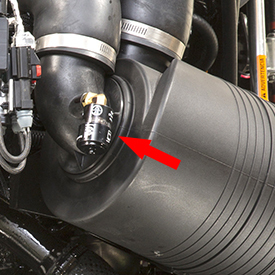 Additional sealing around the operator station reduces the amount of hot air blowing on the operator, which in turn improves operator comfort. The rear bumper helps with hood sealing and reduces the potential for rear hood damage. Based on load, air temperatures, and rpm, the engine control unit (ECU) opens (or closes) the EGR valve, allowing exhaust gases into the intake manifold. The gases mix with the rest of the incoming air from the turbocharger and aftercooler. A hydrostatic transmission is used for reliable operation. High range has maximum speed of 15 mph (24.1 km/h) for faster transport. 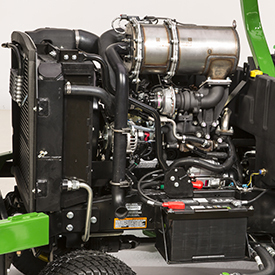 Power take-off (PTO) can be engaged for mowing in high range. Low range has a maximum speed of 9 mph (14.5 km/h). The wide-area mower (WAM) can mow in both low and high range. It locks both the front drive wheels together for extra traction, when needed. 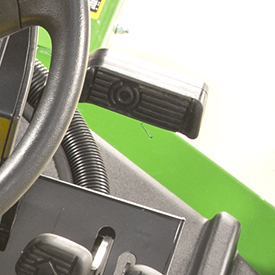 Conveniently located pedal allows the operator to engage the differential lock. 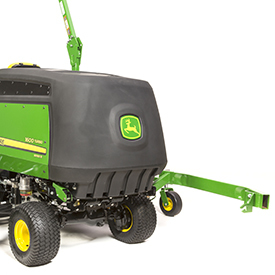 An innovative, exclusive air-intake system draws clean air from the top of the machine instead of the rear. This keeps the radiator cleaner and prevents the engine from overheating. The high-capacity cooling system combines the radiator and hydraulic oil cooler. Low-effort controls are conveniently grouped on the right-hand side. The individual brakes can be applied by the operator as a traction aid or to reduce the turning radius. Brake is easy to use. 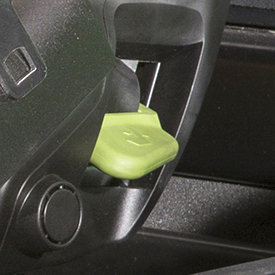 Push-pull-type parking brake release allows the operator to simply pull out the knob and depress the foot brake to engage. To disengage, simply push the foot brake pedal and push the knob in to initiate release. Brake provides stopping power to both drive wheels. The stop brake is used for a parking brake. 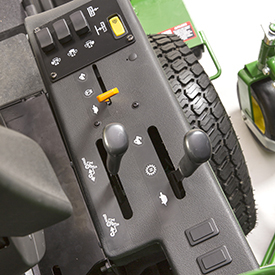 The differential lock is located on the left side of the platform; this allows for easy use of the Twin Touch foot pedals (on the right side) while engaging the differential lock at the same time. 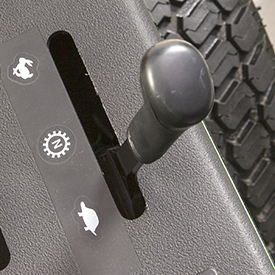 The high-/low range lever allows the operator to select the desired speed range. The machine must be stopped to shift between ranges. Shifting to the neutral position allows the operator to by-pass the hydraulic drive for towing. 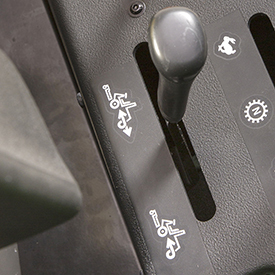 The 4WD lever allows the operator to engage 4WD in reverse. 4WD is automatically engaged when wheel slip occurs in forward drive. To engage, simply push forward on the cruise control switch and hold until the foot is removed from the forward pedal. 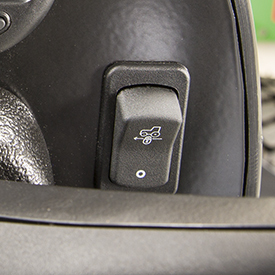 For an emergency stop, cruise can be released by pushing on the master brake pedal or turning the cruise control switch off. 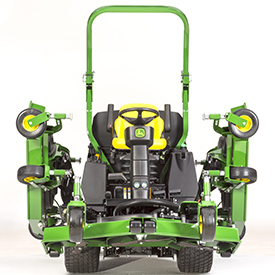 The mower deck switches allow the operator to vary mowing widths, engage and disengage the wing-deck blades, and service and transport the machine. Weight and height adjustment allow for proper ride and suspension height. Fore-aft sear slide adjustment helps account for a wide range of heights. 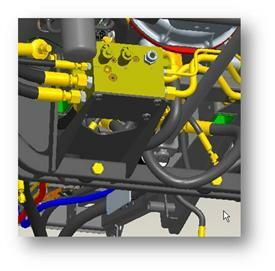 Fore-aft suspension travel to improve directional changes during operation. 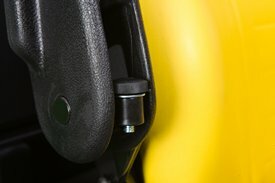 Back angle tilt adjustment is available for the back portion of the seat. Lumbar adjustment provides proper back support. Standard, adjustable armrests are made of a durable material that provides adequate support and surface area for the operator's arms. High seat-back profile features body-contoured seat cushions. Cushions are ideal for those who seek proper back support. 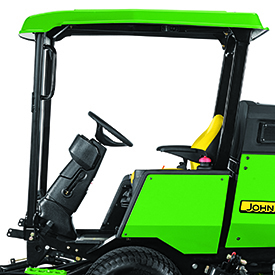 The highly-resilient contoured foam construction allows for all-day mowing comfort. 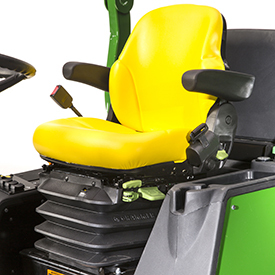 A raised seat ensures a commanding view to the front and side mower decks. 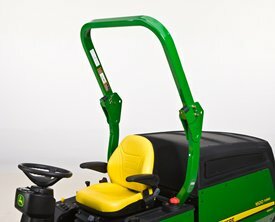 The retractable seat belt is convenient to use. 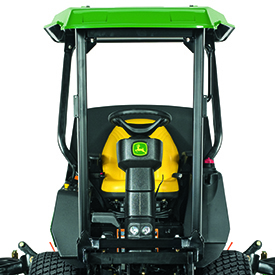 The comfortable seat, along with ample legroom in the operator's platform, convenient pedal locations, and adjustable steering column make operator comfort on the John Deere 1600 Turbo Wide-Area Mower among the best in the industry. The standard air-ride seat with adjustable armrests is designed with comfort, safety, and ergonomics in mind, ensuring relaxed, healthy sitting for hours on end. 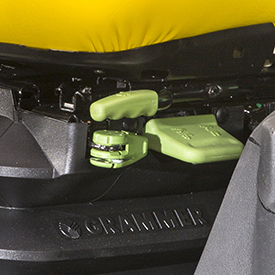 Adjustments are provided for operator armrests, lumbar support, and back angle, and air suspension is adjustable for the operator’s weight and ride. 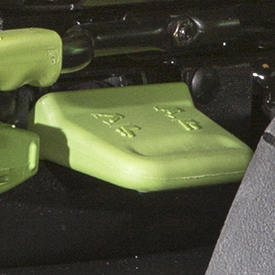 The armrests are standard and the seat pads are replaceable. When used in combination with seat belts and safe operating practices, the ROPS is effective in reducing serious injuries and death from rollover accidents. The standard-equipment Roll-Gard ROPS can be folded to allow for additional clearance when needed. With the ROPS in the folded-down position, the machine fits under a standard doorway. 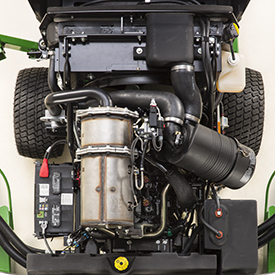 The ROPS meets the International Organization for Standardization (ISO) 21299 ROPS standard – defined test procedures and acceptance criteria for the rollover protective structures of powered ride-on turf care machinery. Under the support of the Outdoor Power Equipment Institute (OPEI), a panel was formed that brought together an international group of ROPS experts that presented the best-learned practices regarding off-highway vehicle operator crush protection. The result of this undertaking is a standard dedicated to protecting operators of powered ride-on turf maintenance equipment. 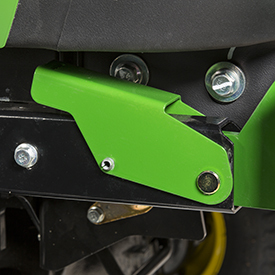 The folding ROPS enhances operator safety and still provides clearance when loading on enclosed trailers. 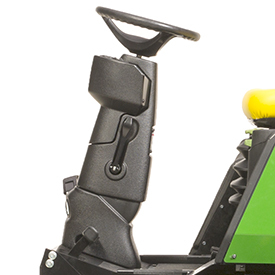 Folding the ROPS is simple - remove two pins and rotate the top of the Roll-Gard ROPS down. Adjustments can be made from the operator's station. Due to the high percentage of operators who prefer the four-post ROPS canopy, a factory-installed option is available. The rear ROPS structure is a black fixed two-post ROPS. The four-post ROPS provides the ability to meet bid requirements that call for a four-post ROPS and offers the ability to use a weather enclosure. It also meets the International Organization for Standardization (ISO) 21299 standard. The wing decks rise to a narrow 84-in. (213.4-cm) width and can be locked into transport position. A machine transport speed of 15 mph (24.1 km/h) means the operator can spend less time transporting and more time mowing. NOTE: The power take-off (PTO) can be engaged while in the transport position. Fasten the machine to the trailer with heavy-duty straps, chains, or cables. Fasten the rear strap to the tow loop behind the rear axle. Fasten the front strap to tie down holes on the operator's platform. Both the front and rear straps must be directed down and outward from the machine. The rear, frame-mounted bumper provides for excellent rear protection and effective hood sealing for engine cooling. 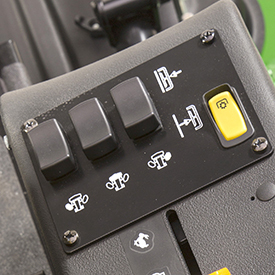 To operate, pull out on the bottom of the engine cover latches on the left and right side of machine behind the operator’s seat. Unhook the tops of the engine cover latches from the hooks on the engine cover. Push down on the bumper lever and rotate the bumper to the right side of the machine. 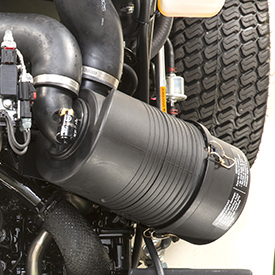 The 1600 Turbo Series III WAM is equipped with a 62-in. (157.5-cm) center deck and two 42-in. (106.7-cm) wings. Cutting widths are 128 in. (325.1 cm) using all three decks, 94 in. (238.8 cm) using the center deck and either wing deck, and 62 in. (157.5 cm) with the center deck only. All decks are rear discharge. Wings fold for transport and reduce the machine’s width to a narrow 84 in. (213 cm), so it can easily be driven along golf-cart-size paths or fit on a trailer. The wing decks will float 45 degrees above horizontal and 20 degrees below horizontal, following the ground contour. All decks have a unique baffling system that reduces clumping and provides even clipping dispersal for exceptional appearance. This exclusive feature allows the wing decks to move rearward and inward when contacting obstructions such as trees, curbs, or other solid objects to prevent damage. 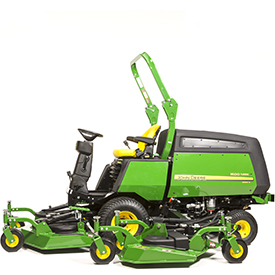 Mowers are safety certified (meaning that mowers have been evaluated by the manufacturer [John Deere Turf Care] and conform to American National Standards Institute [ANSI] B71.4 Safety Certification Specifications for Commercial Turf Care Equipment). 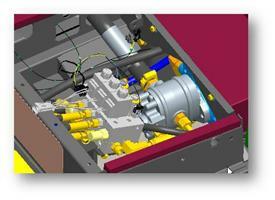 The isolated deck motor design consists of three cast-iron mounting structures for the deck motors. 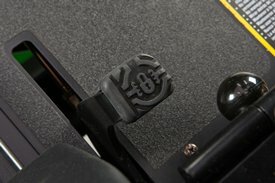 Rubber isolators that are similar to engine mount isolators are located between the castings and the deck shell brackets. The rubber isolators allow the castings to flex relative to the deck shell. The addition of the isolators stops the vibration path between the hydraulic motor and the deck shell, thus preventing the amplification of sound by the deck shell. 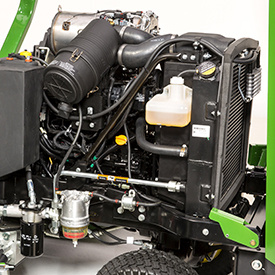 The deck motors are capable of withstanding high pressure requirements for all-day mowing. Motors have Viton seals, which can withstand higher hydraulic temperatures. 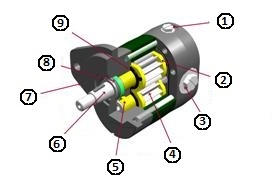 The motor contains a dust seal to help eliminate debris from entering into the hydraulic connections. The lift valve controls the cylinders that lift and lower the decks. 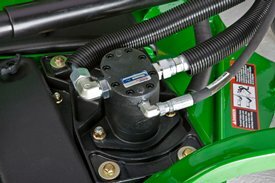 It also controls the axial piston deck-motor pump (turns it on and off). The mow valve controls the hydraulic flow to the wing deck circuits. 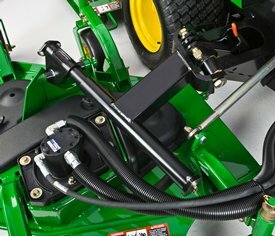 A mulch kit is available as an attachment for field conversion. The mulch kit includes unique mulch blades, baffles, and a deflector shield to produce smaller clippings, which decompose faster than un-mulched clippings. Operators should follow the one-third rule when mulching grass. This mulch kit also does an excellent job when mulching leaves. Viton is a trademark of The Chemours Company. This light kit signals that the unit is approaching. The light is positioned on top of the canopy or on the rollover protective structure (ROPS) with a breakaway bracket. This ensures that if struck, the light will not break, but move out of the way. 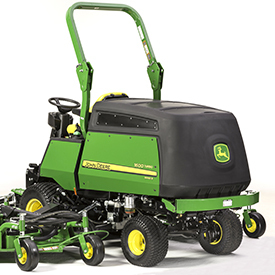 BUC10062 - for wide­-area mowers with serial numbers 500,001 and higher. 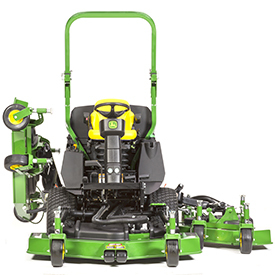 TCB11580 - for wide-­area mowers with serial numbers 090,001 to 500,000. 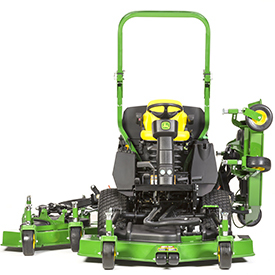 TCB10353 (discontinued) - for wide-­area mowers with serial numbers 090,000 and lower. The road light kit is for use when transporting the machine. 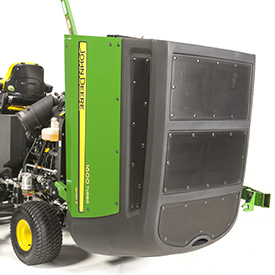 BUC10063 - for wide­area mowers with serial numbers 500,001 and higher. 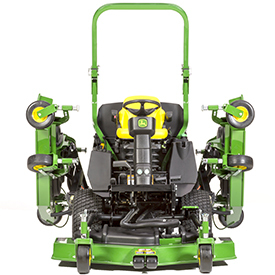 TCB11701 - for wide­area mowers with serial numbers 090,001 to 500,000. TCB10582 (discontinued) - for wide­area mowers with serial numbers 090,000 and lower. 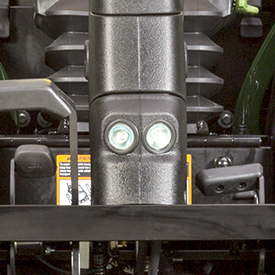 This front light kit allows operating mower during twilight hours for increased productivity. 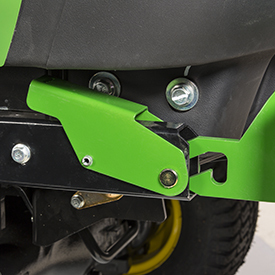 BUC10064 - for wide­area mowers with serial numbers 500,001 and higher. 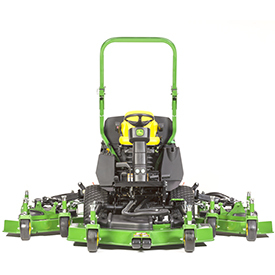 TCB11581 - for wide­area mowers with serial numbers 090,001 to 500,000. 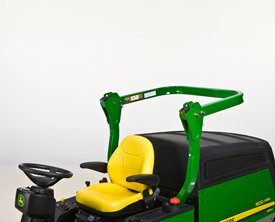 TCB10583 (discontinued) - for wide­area mowers with serial numbers 090,000 and lower. 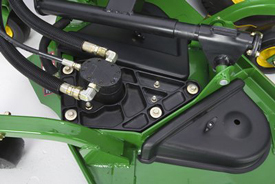 model year 2010 and earlier wide-area mowers, wiring harness part number TCA13797 is not part of this kit and must be ordered separately. This warning sign is used to indicate that the unit is a slow-moving vehicle. The mulch kit includes unique mulch blades, baffles, and deflector shield to produce smaller clippings, which decompose faster than unmulched clippings. Operators should follow the one-third rule when mulching in grass. 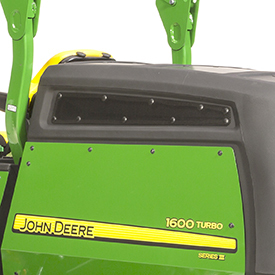 NOTE: Includes mulching blades, baffles, and deflector shields for center and wing mower decks. Please also note that machine serial number determines which bundle number is required. These kits are not interchangeable between production ranges. Displacement, axial piston pump, 3 cu in. Displacement, axial piston pump, 2 cu in. With four-post canopy ROPS, 82 in. Displacement, axial piston pump, 2.48 cu in. Displacement, gear motor, 2.5 cu in. Heat treated, diameter, 1 in.